ABCD parameters can be used to describe the behavior of a linear network, just as S-parameters can. Most microwave engineers are very familiar with S-parameters, we use them every day in taking data, writing reports and presentations. So why would you consider using ABCD parameters? The answer is simple; ABCD matrices can be cascaded to provide the performance of two cascaded networks, S-parameters don't have a neat solution for cascades. So behind the scenes, anyone that is doing math with vector S-parameters is probably converting to ABCD before and after the operations! 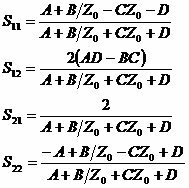 For a more complete discussion of and the mathematical basis for network parameters such as the ABCD parameters set check out our Network Parameters page.